Not to be confused with Network Rail. For the Australian railway operator of the same name, see National Rail Corporation. National Rail (NR) in the United Kingdom is the trading name licensed for use by the Rail Delivery Group, an unincorporated association whose membership consists of the passenger train operating companies (TOCs) of England, Scotland, and Wales. The TOCs run the passenger services previously provided by the British Railways Board, from 1965 using the brand name British Rail. Northern Ireland, which is bordered by the Republic of Ireland, has a different system. National Rail services share a ticketing structure and inter-availability that generally do not extend to services which were not part of British Rail. The name and the accompanying double arrow symbol are trademarks of the Secretary of State for Transport. National Rail should not be confused with Network Rail. National Rail is a brand used to promote passenger railway services, and providing some harmonisation for passengers in ticketing, while Network Rail is the organisation which owns and manages most of the fixed assets of the railway network, including tracks, stations and signals. The two generally coincide where passenger services are run. Most major Network Rail lines also carry freight traffic and some lines are freight only. There are some scheduled passenger services on privately managed, non-Network Rail lines, for example Heathrow Express, which partly runs on Network Rail track. The London Underground also overlaps with Network Rail in places. Twenty eight privately owned train operating companies, each franchised for a defined term by government, operate passenger trains on the main rail network in Great Britain. The Rail Delivery Group is the trade association representing the TOCs and provides core services, including the provision of the National Rail Enquiries service. It also runs Rail Settlement Plan, which allocates ticket revenue to the various TOCs, and Rail Staff Travel, which manages travel facilities for railway staff. It does not compile the national timetable, which is the joint responsibility of the Office of Rail Regulation (allocation of paths) and Network Rail (timetable production and publication). Since the privatisation of British Rail there is no longer a single approach to design on railways in Great Britain. The look and feel of signage, liveries and marketing material is largely the preserve of the individual TOCs. However, National Rail continues to use BR's famous double-arrow symbol, designed by Gerald Burney of the Design Research Unit. It has been incorporated in the National Rail logotype and is displayed on tickets, the National Rail website and other publicity. The trademark rights to the double arrow symbol remain state-owned, being vested in the Secretary of State for Transport. The lettering used in the National Rail logotype is a modified form of the typeface Sassoon Bold. Some train operating companies continue to use the former British Rail Rail Alphabet lettering to varying degrees in station signage, although its use is no longer universal; however it remains compulsory (under Railway Group Standards) for safety signage in trackside areas and is still common (although not universal) on rolling stock. The British Rail typefaces of choice from 1965 were Helvetica and Univers, with others (particularly Frutiger) coming into use during the sectorisation period after 1983. TOCs may use what they like: examples include Futura (Stagecoach Group), Helvetica (FirstGroup and National Express), Frutiger (Arriva Trains Wales), Bliss (CrossCountry), and a modified version of Precious by London Midland. Several conurbations have their own metro or tram systems, most of which are not part of National Rail. These include the London Underground, Docklands Light Railway, London Tramlink, Blackpool Tramway, Glasgow Subway, Tyne & Wear Metro, Manchester Metrolink, Sheffield Supertram, Midland Metro and Nottingham Express Transit. On the other hand, the largely self-contained Merseyrail system is part of the National Rail network, and urban rail networks around Birmingham, Cardiff, Glasgow and West Yorkshire consist entirely of National Rail services. London Overground (LO) is a hybrid: its services are operated via a concession awarded by Transport for London, and are branded accordingly, but until 2010 all its routes used infrastructure owned by Network Rail. LO now also possesses some infrastructure in its own right, following the reopening of the former London Underground East London line as the East London Railway. Since all the previous LO routes were operated by National Rail franchise Silverlink until November 2007, they have continued to be shown in the National Rail timetable and are still considered to be a part of National Rail. Heathrow Express and Eurostar are also not part of the National Rail network despite sharing of stations (Heathrow Express also share its route with GWR and TfL Rail). Northern Ireland Railways were never part of British Rail, which was limited to England, Scotland and Wales, and therefore are not part of the National Rail network. There are many privately owned or heritage railways in Great Britain which are not part of the National Rail network and mostly operate for heritage or pleasure purposes rather than as public transport. 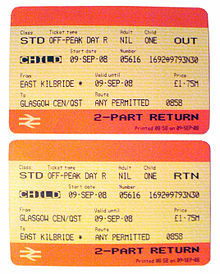 National Rail services have a common ticketing structure inherited from British Rail. Through tickets are available between any pair of stations on the network, and can be bought from any station ticket office. Most tickets are inter-available between the services of all operators on routes appropriate to the journey being made. Operators on some routes offer operator-specific tickets that are cheaper than the inter-available ones. Through tickets involving Heathrow Express and London Underground are also available. Oyster pay-as-you-go can be used on National Rail in Greater London from 2 January 2010. Passengers without a valid ticket boarding a train at a station where ticket-buying facilities are available are required to pay the full Open Single or Return fare. On some services penalty fares apply - a ticketless passenger may be charged the greater of £20 or twice the full single fare to the next stop. Penalty Fares can be collected only by authorised Revenue Protection Inspectors, not by ordinary Guards. National Rail distributes a number of technical manuals on which travel on the railways in Great Britain is based, such as the National Rail Conditions of Travel, via their website. The National Rail Enquiries website includes a journey planner, fare and live departure information. The site is designed to complement the myriad different websites of Britain's privatised rail companies, so when users have selected which tickets they wish to buy, they are redirected to the most relevant train company website, where they can buy their tickets without booking fees. In 2012 the website was joined by a mobile app mirroring its functionality. The app is available for iPhone, Android and Windows Phone. However Trainline remains the most downloaded rail app in the UK with 9.4 million users. ^ "National Rail Descriptor Guidelines". National Rail Descriptor Guidelines. Rail Delivery Group. Archived from the original on 7 October 2017. Retrieved 24 October 2017. ^ "Archived copy". Archived from the original on 1 October 2016. Retrieved 1 October 2016. CS1 maint: Archived copy as title (link): "British Rail’s double-arrow"
^ "Archived copy". Archived from the original on 23 May 2013. Retrieved 5 April 2013. CS1 maint: Archived copy as title (link): "National Rail is the collective brand for Britain's train companies working together"
^ "National Rail Conditions of Travel". National Rail. Rail Delivery Group. Archived from the original on 21 October 2017. Retrieved 24 October 2017. ^ "Electronic National Rail Timetable". Network Rail. Network Rail. Archived from the original on 30 December 2016. Retrieved 24 October 2017. ^ "National Rail Enquiries announces a new app for iPhone & Android". National Rail blog. National Rail Enquiries. 1 May 2012. Archived from the original on 8 October 2016. Retrieved 1 October 2016. ^ "Download our FREE app and become more mobile and get FREE alerts". National Rail Enquiries. National Rail. Archived from the original on 30 September 2016. Retrieved 1 October 2016. ^ "Mobile App - Trainline". Trainline. Archived from the original on 30 September 2016. Retrieved 1 October 2016.